The conference was a fruitful time of strengthening existing relationships and establishing new ones. 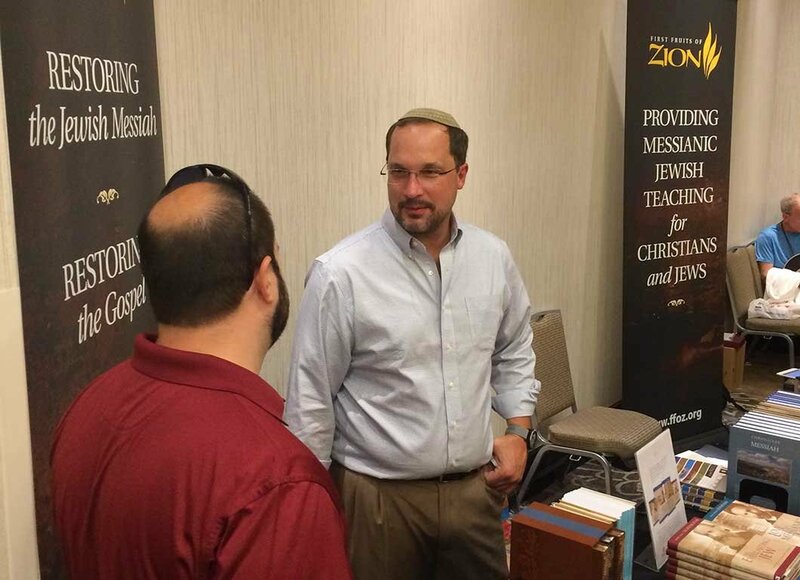 Boaz Michael in a conversation at the First Fruits of Zion table at the UMJC conference in Ontario, California. This month, First Fruits of Zion was pleased to once again be a part of the Union of Messianic Jewish Congregations (UMJC) annual conference in Ontario, California. 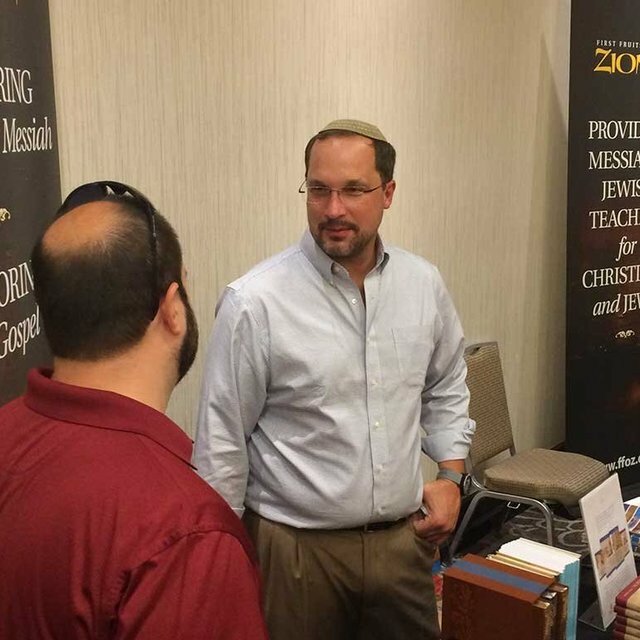 Boaz Michael and Ryan Lambert enjoyed four days of interacting with representatives from Messianic Jewish congregations from all over the United States. Below are some brief highlights from the conference. On day two of the conference, Boaz had the opportunity to give a lecture on the life of Pauline Rose in anticipation of two new books that FFOZ will soon be releasing about her life. Boaz’s lecture was one of the most well attended sessions at the conference. A broad range of listeners were deeply interested in learning about this special Messianic Jewish woman who lived on Mount Zion and established a reputation as “the lady of Mount Zion.” Mrs. Rose earned this name due to her consistent efforts to cultivate peace and tranquility on Mount Zion by having a home known for generous hospitality and a garden with “Messianic type” vibrancy and beauty. After Boaz’s lecture, many attendees flocked to the FFOZ book table to purchase the new Pauline Rose books that first became available at this conference. We are looking forward to many more people finding hope and inspiration from the story of the faith and faithfulness of Pauline Rose. For the remainder of the week, our staff enjoyed interactions and opportunities with the many people who visited our book table. We answered questions, listened to people’s stories, and put resources into hands that will help the Messianic Jewish world to know and follow Jesus better. It was a fruitful time of strengthening existing relationships and establishing new ones. Our presence at the UMJC conference also allowed us to meet with many colleagues and friends—both old and new—to discuss ways that First Fruits of Zion can serve them and partner with them in their own congregational or ministry context. We are thankful that God has given us the ability to produce vision and teaching that is helping to shape and cultivate the development of Messianic Judaism in so many places.